Windsor Grill, the award-winning grill restaurant on St Leonard’s Road, has today launched a special menu to mark the much-awaited wedding of HRH Prince Harry and Meghan Markle in May. Running over the weekend of the wedding, the restaurant has developed a tailored menu which includes dishes and ingredients inspired by the couple. It will include specials such as cottage pie and fish cakes, which are rumoured to be Prince Harry’s favourite dishes; as well as seared tuna nicoise, and linguine with slow-cooked courgettes, lemon and goats cheese, which are twists on Ms Markle’s favourite meals. The restaurant has even sourced Grey Owl Goat’s cheese from Fromagerie Le Detour in Quebec, Canada – which is believed to be Ms Markle’s favourite cheese. Alongside these, the restaurant is also laying on a special elderflower and lemon dessert as this has been confirmed as the choice of flavour of the royal wedding cake itself. 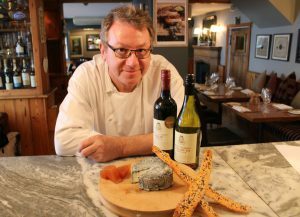 Chef Patron David Wilby has also worked with his wine supplier to locate two rare wines from a vineyard in Australia. The wines, named Elizabeth and Philip, pay homepage to Prince Harry’s grandparents and were first produced when Her Majesty the Queen and Prince Philip visited the wine estate during their honeymoon. The restaurant, which is usually only open for dinner on Monday to Saturday, is extending its opening hours to fit around the wedding weekend. It will be open from Saturday at 2pm to 10pm and Sunday afternoon 11.30am to 4pm (last orders), offering lunch and dinner on the Saturday and brunch and lunch on the Sunday. Wilby said: “As a proud independent Windsor restaurant, we are very excited about the wedding. It’s really important to mark these occasions which is why, alongside our usual favourites, we thought we’d have a bit of fun with our menus. “Our regular customers know how much effort we go to in order to provide good food using the best ingredients. That’s why we’ve scoured the globe to make sure that we have some special items on the menu for such a special occasion.